"Like fried cabbage? Then you are in for a treat. This is easy and most kids are actually surprised that it tastes better than it looks! I add about 2 tablespoons sugar simply to soften the taste and make my kids happy. But it is delicious without the sugar, and when I leave it out, I don't tell them and they never say a word!" Place bacon pieces in a large skillet and cook over medium-high heat, turning occasionally, until evenly browned, about 10 minutes. Drain on paper towels, leaving grease in the skillet. Cook onion in the bacon grease in the skillet until translucent, about 5 minutes. 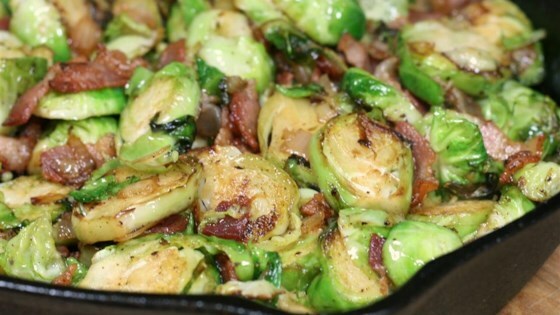 Add Brussels sprouts and toss to coat in the bacon grease. Cook and stir until browned and tender, about 5 minutes. Stir in sugar, salt, and black pepper; sprinkle in bacon pieces. Best-ever way to eat your sprouts! As written I gave it a 3...after dumping the suger and adding fresh shrooms...a 5 and a keeper. This is a very yummy recipe! I used brown sugar instead of white & added garlic & it was very good.